What impact are the new generations having on the workplace? What steps do HR and L&D professionals need to take in order to bridge the generation gap? Join us for an exclusive training session with HR and L&D professionals from all over the world and practice your Business English while talking about the Millennials and Gen Z. 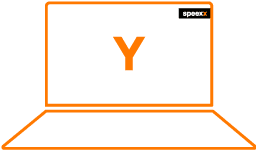 The Speexx Power Up webinar series helps you get exactly the Business English language skills you need to perform in typical HR management and L&D areas, such as digital transformation, engagement, performance management or talent development. Master key vocabulary in an entertaining, yet effective way for social and formal situations. Brush up your English on the latest terms used by Millennials in just 45 minutes. And it is absolutely free, no obligations. Meet professionals from all over the world and let our trainers guide you in interesting conversations about the new generations in the workplace. You will not even notice that you’re learning English! Groups are limited to 15 seats.